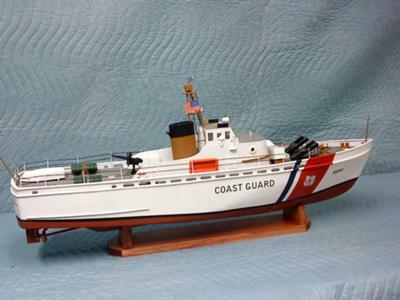 I recently completed a 1:30 scratch built scale model of a Cape class coast guard cutter, inspired by the Lindberg plastic model kit. It turned out so well, the next step for me is to reproduce the original work with a hollow hull and fitted for remote control. Here's where the trouble begins. I have not a clue what I should be looking to purchase. I know I would like dual props and two motors, each direct drive, forward, reverse and fully speed controlled independent of each other (I presume) and a way to control the dual rudders. My ship is about 35" long, 7" wide amidships and 14" tall. I expect to make the hull out of wood and sealer with all work above the main deck to be balsa. What I don't know is how to match all these devices together with a radio transmitter etc. in a single purchase. A secondary question would involve mounting the system within the hull and still maintaining water-tightness at the prop shaft and rudder shaft penetrations. Can you help? 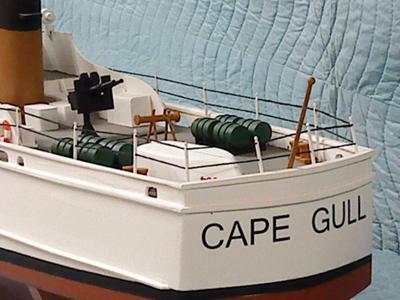 First of all - Kudos for pulling off an excellent build of your model boat. Second, congrats for venturing into the world of RC. A good choice in my opinion. That's a lot of good questions you have. Unfortunately I can't answer all on one page. Some of your questions have been asked before in different contexts and in slightly different forms. It's a good indicator I probably should write a separate page for several of those questions. I don't think I've ever been successful in getting everything in a single purchase, mainly for two reasons. First, I tend to stagger the purchases so I get what I need when I need it, looking ahead just a little. Second, I have yet to find a store, on-line or off, that can provide me with everything I need at the best price. My answer here will touch briefly on what stands out to me as most important from where you seem to be at. 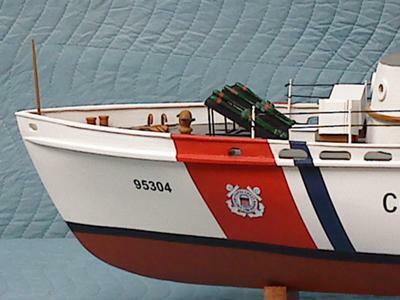 I'm assuming you have not actually started building the model boat yet. These are good numbers. You have plenty of displacement to work with, without requiring extreme construction methods. That said, it's always good practice to keep the weight down wherever you can. Access hatch - make sure you have a plan for how you are going to access the "guts" of the model boat once it's finished. It's good practice to have easy access to everything to do with control and propulsion. The most desirable solutions are concealed as deck houses etc. Don't forget access to the rudder. 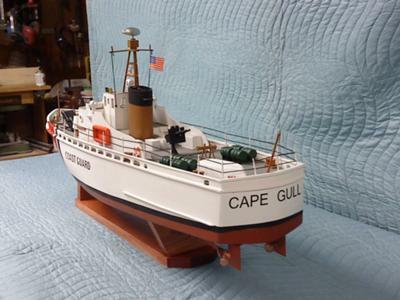 It is often the most difficult hatch to work out cleanly on scale model boats. Rudder - A working rudder is not that hard to make. You need a well supported stuffing tube. If you make sure the upper end of the tube is just slightly above the waterline, you'll never have to worry about water coming in. I like to use a brass tube with a close fitting brass rod as a shaft. I almost always make the rudders with a hardwood core the same thickness as the rod. I cut a piece in front of the rod and one behind it, both oversize. I try and make the brass rod not protrude outside the final shape of the rudder. Next I sandwich it all between two pieces of thin plywood. Epoxy it all together, making sure the pieces don't slide around on me. Once the epoxy is set I sand it to shape. Installing rudder servos and linkage is difficult to explain in only so many words. With two rudders you'll need something to keep the rudders parallel. It could either be a linkage to keep two servos working off the same channel. I think this can be worked out later, as long as you make sure there is access to fiddle with it. Propeller Shafts - Most propellers and shafts for scale model boats have metric threads - M4 being the most common. To avoid taking in water, the stuffing tube is filled with grease before the propeller shaft goes in. The high viscosity of the grease is enough to keep the water out. Vaseline works well enough. The tube doesn't have to be full of grease in its entire length. I typically aim for two inches closest to the propeller. You need to figure out what length shaft to buy, and it can be tricky. Nowadays I work it out in a CAD program on the computer. In the old days, I'd drill a hole in the hull where the shaft were to go. I'd use a dowel or metal rod that I inserted in the hole and laid the motor and coupling inside the hull and buy a shaft the length of the dowel/rod. They typically come in two inch increments - 8, 10, 12 inches etc. Graupner is probably the most common brand, but there are others (Dumas comes to mind, but their selection is poor). http://www.v-eastonline.com/ is the US distributor. Delivery can be a problem, so order ahead of time. Propellers - Rarely have I been able to pick a single propeller and motor combination that I've been happy with. The easiest, cheapest and laziest approach is to commit to a motor and be flexible when it comes to the prop. You may want to consider buying at least three sets of varying diameter just to be safe. The type of boat you are building is not a speed demon, so leave the high-performance race propellers behind. I'd look for three-bladed propellers with a pitch 1.1 to 1.4 times the diameter. You'll need one left and one right handed. To keep the cost down, get plastic propellers and when you're in the ball-park you can upgrade to brass or bronze later. Motor - The power requirement is split between two motors on the model. I think two 500-size motors would get you there. Master Airscrew Speed 550 or Graupner Speed 500 would probably work well. The work-point for the motors will probably not be at max efficiency, since it's a direct drive. These motors should provide plenty of headroom though, so it shouldn't be a problem. I also feel you have enough displacement to be able to haul as much batteries as you'll need. I have a feeling, since you are thinking of running direct drive, that the smaller propeller you use, the more efficient the motors will run. Motor Coupling - Again, Graupner has some decent quality couplings. Since you will be using a left and a right hand propeller, I'd stay clear of the coupling that looks like an extension spring between two clamp collars. They don't transmit power equally when rotating left vs. right. Instead, look for the universal joint looking couplings. The best ones have two knuckles - one to adjust for angular misalignment, and the other for radial offset. The couplings typically come with some brass tubes to be used as shaft adapters between common shaft sizes. 1/8" is the standard motor shaft size for the 500/550 size motors. As mentioned earlier, 4mm is the most common propeller shaft diameter. Most of what I've left out has to do with the RC controls - Transmitter, servos, Speed control etc. I feel that can be worked out once the boat is built and rudders, shafts, motors etc are in place. Hopefully, I'll have articles covering those aspects in detail once you get there. Browse the Q&A, there has been questions about many of these in other contexts. The answers may not be general enough to give you a definite answer, but maybe help you enough to come back with a more specific question later on. Best of luck for now! I don't know how old this blog is, but thought I'd add some input on the question of how to seal the drive system from water leakage. I just completed a Dumas tug model and the idea of using a grease stuffing shaft didn't appeal to me. In my job as an engineer, we sometimes have to transmit motion through a vacuum chamber wall and use magnetic couplings to do this. I adapted this approach to the tug drive and built my own version of the coupling. Basically, the motor drives a set of magnets in a housing and couples magnetically to a magnetic rotor which is housed in a waterproof canister. The rotor is connected to the drive shaft which passes through a tube which is epoxy sealed to the hull. The canister prevents water from entering the hull and is absolutely leak proof. No grease, oil or mess! For independent control of two motors the best bet will be using one of the new helicopter radios and two ESCs. You can set one stick for throttle up and down and use the right and left for differential of each motor. I use the inexpensive Fly Sky 6 channel radio. You might want the 9 channel for more goodies. Try brushless motors, you can carry battery less weight a get better performance.